Handy Art® Student Medium Body Acrylics have a higher viscosity and are similar to our pourable acrylic paints in color strength. Handy Art® Medium Body Acrylics offer a thicker texture and feel for a variety of application techniques and dry to a permanent, waterproof, lightfast and flexible gloss finish. 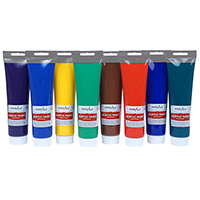 Handy Art® Student Acrylics are certified AP non-toxic.